Lytle Farm is a new town of 1,730 residences located in Dauphin County, Pennsylvania, near the Susquehanna River. The town’s founder sought a pattern book to ensure that the community followed the form of a traditional Pennsylvania town. Just as such towns often focus on a crossroads, the Lytle Farm commercial village surrounds a four-way intersection. The variety of buildings and lot types provide diversity with civic buildings, commercial buildings, mixed-use buildings, townhouses, condominiums, apartments, a continuing care retirement community, and a variety of single-family lot types. The diverse uses will create a community that revives a town-scale urbanism that has not been built in central Pennsylvania in more than a generation. The pattern book addresses building, architectural, circulation, and landscape patterns. 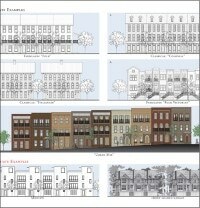 It is based on the transect and illustrates the overall form of the community with a regulating plan. 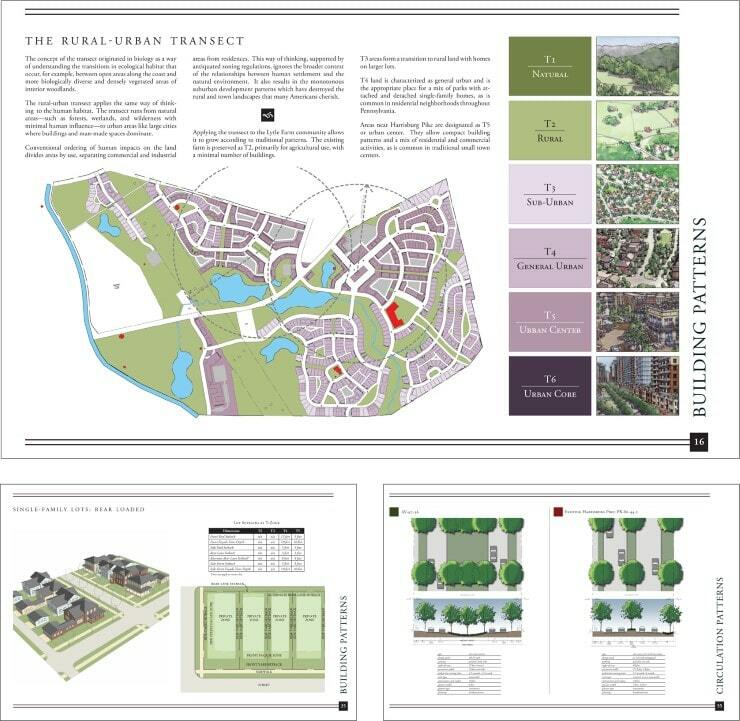 The building patterns section includes a regulating plan, building and lot type plans, lot standards, and graphics. The architectural patterns are based on the rich diversity of styles in the towns and small communities of Dauphin and Lancaster Counties. The circulation patterns define and create tree-lined streets with sidewalks and pedestrian-oriented buildings that lead to paths and greenways running through the neighborhood. Landscape patterns address open spaces and define treatments. In addition, landscape guidelines for fences, walls, plant materials, bioswales, water bodies, pavement, lighting, site furniture, and signs are included to create a distinct place that recalls an earlier time.